Browse our comparison page on Bellamy’s infant formula so that you can make a discerning choice on what will be most suitable for your child. 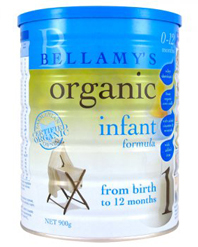 Bellamy's Organic Step 1 Infant Formula is suitable for most babies from birth through to 12 months. It’s made from certified organic cow’s milk, blended with essential fatty acids, vitamins and minerals so you can be sure you are offering your baby the best nutrition in accordance with world-class Australian Food guidelines and standards. Our Infant Formula is whey dominant which means that it is easy for babies to digest and perfectly balanced to provide your baby’s nutritional needs. While we believe that ‘breast is best’, the truth is that many women are unable to breastfeed their newborns for an extended period of time or, in some cases, at all. That is why you can find a range of helpful information across our website regarding parenting, breast feeding, formula feeding and more. We aim to guide you towards choosing the best option for you and your child, whether that is dairy based, soy, organic baby formula or anything in between. You can learn more about the different types of formula products available on our website, allowing you to make an informed decision on what to feed your baby. If you have any questions about the information on our website, please don’t hesitate to get in touch with us via our online form. 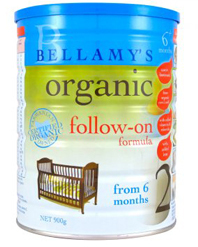 We will get back to you as soon as possible and with all the information you require regarding Bellamy’s infant formula.